The Wave Texture node defines a procedural Wave texture. Drag the Wave Texture icon into the Node Graph. Adjust the attributes of the Wave Texture node. Defines the color A of the Wave texture. Defines the opacity A of the Wave texture. Defines the color B of the Wave texture. Defines the opacity B of the Wave texture. 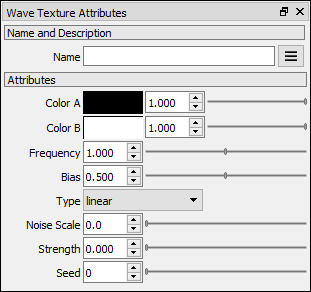 Defines the frequency of the Wave texture. Defines the distortion of the wave. At 0.5 the wave is centered. Defines the type wave. Linear: The wave expands parallel to the X coordinate. Cylindrical: The wave expands in a cylindrical way. Spherical: The wave expands in a spherical way. Defines the scale of the distortion produced by the wave noise. Defines the strength of the distortion produced by the wave noise. Defines the seed of the wave noise.